Sakai Guides and DocumentationTeaching Assistant Guide Gradebook BasicsHow do I view and organize information in Gradebook? Filtering the list of students. The Gradebook allows you to filter the student list by section/group or by searching for all or part of a student's name. Select the desired section or group from the drop-down menu at the top to view only that section/group. Zoom: Filter by search criteria. Enter part or all of a student's name to display only matching results in the list. The dynamic, wildcard-friendly search will update as you type. Notice the fixed student information and course grade columns. Zoom: Notice the fixed student information and course grade columns. 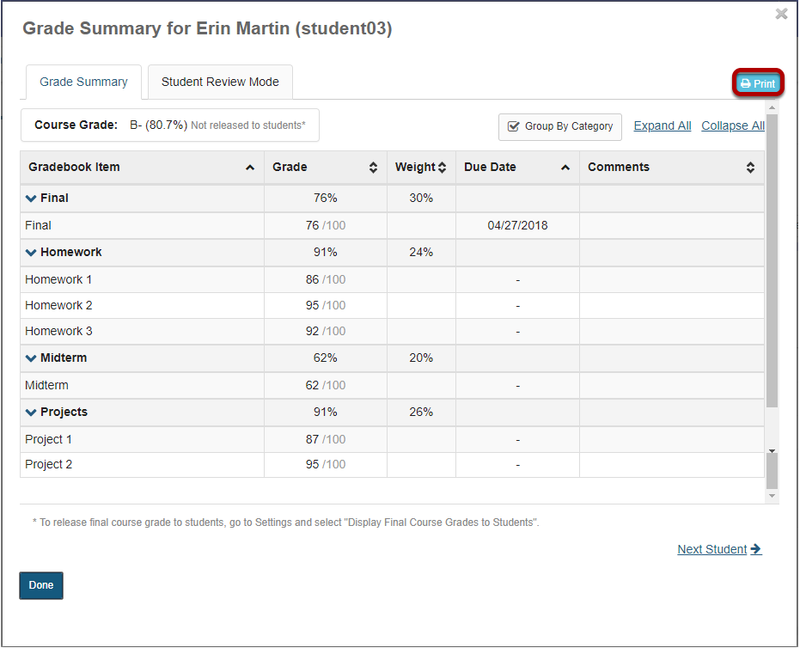 When you scroll sideways to view additional columns on the right, the left-most columns containing student information and course grades remains frozen. Order students by First Name. Zoom: Order students by First Name. The default display for student names is Last Name. First Name. However, if you prefer to view students listed as First Name Last Name, click the down arrow in the Students column and select Order By First Name. Order students by Last Name. Zoom: Order students by Last Name. 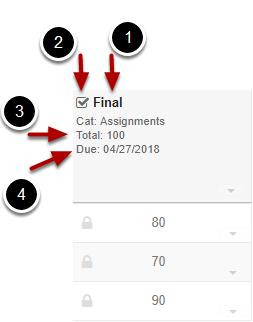 If students are currently display in First Name Last Name order, you may revert to the Last Name, First Name order by clicking the down arrow in the Students column and selecting Order By Last Name. Zoom: Show/hide course grade points. If you would like to display course points, select the down arrow in the Course Grade column and choose Show Points. Note: This option is not available if Categories and Weighting is selected. Tip: If points are already displayed and you would like to hide them, select the down arrow in the Course Grade column and choose Hide Points. 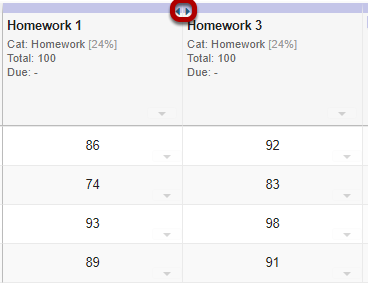 If you have categories in your Gradebook, you may select/deselect the box next to Group by Category to display or hide the category groupings in your view of the Gradebook. 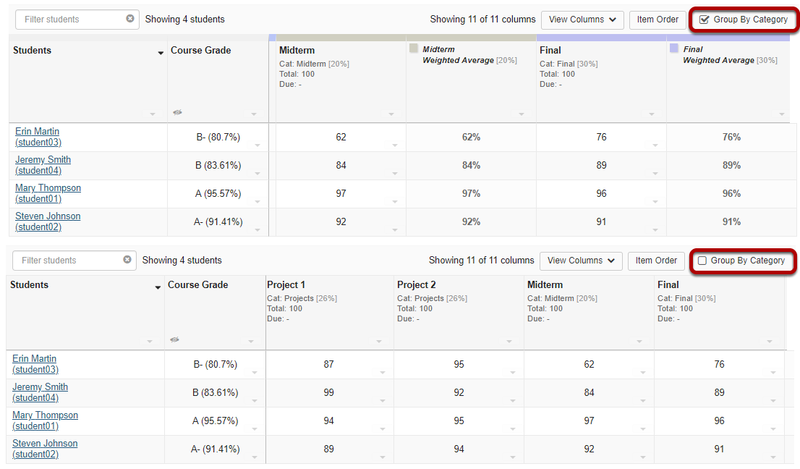 Click View Columns to select which items you want displayed in your current view of the Gradebook. Click on the colored square next to each item to toggle on/off the display of that item. This may be done for an individual item or for an entire category at a time. Shaded items are visible. Unshaded items are hidden. Categories that are half shaded and half unshaded indicate that only some of the items within that category are hidden. 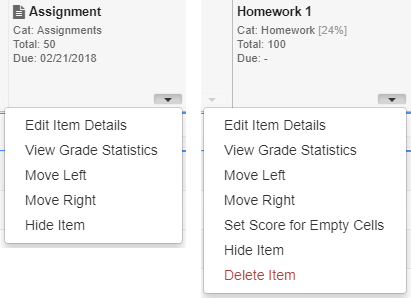 If you want to hide everything except the one item you are currently grading, click on the down arrow next to the item and select Show only this item. To Show All or Hide All items, click on the appropriate link at the top of the menu. Hidden items are indicated by two arrows in place of the item. Click on the arrows to show the item. Note: Show/Hide Items DOES NOT control which items are or are not released to students. It only controls the columns displayed in the instructor view of the tool. Drag and Drop to reorder columns. Zoom: Drag and Drop to reorder columns. You may drag and drop to reorder columns. Note: When viewing items grouped by category, you can only reorder columns within a category. To reorder categories, you need to go to Gradebook > Settings > Categories and Weighting. The icon of the associated tool (i.e. Assignments, Tests & Quizzes, etc.) sending the item to the gradebook. 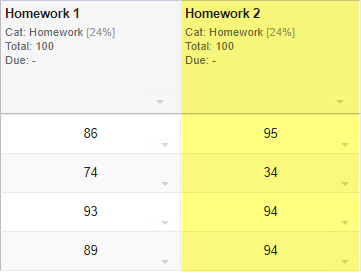 Note: No icon displays if the item was created within the Gradebook tool itself. The total points possible for that item. The due date for the item (if applicable). Sorting by a gradebook column. To sort the list by a gradebook column, click on the title of the item. Click again on the same item title to reverse the sort order. Note: When you are sorting by an item, a directional arrow will display. The direction of the arrow indicates if you are sorting ascending or descending. 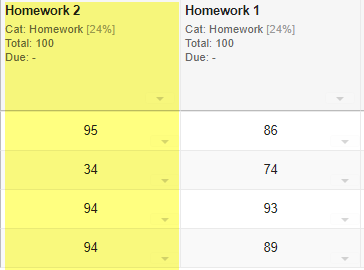 The drop-down menu in each gradebook item column allows you to perform several actions. These actions vary somewhat, depending on the origin of the item. Items created within the Gradebook itself allow more options than items being sent to the Gradebook from other tools. 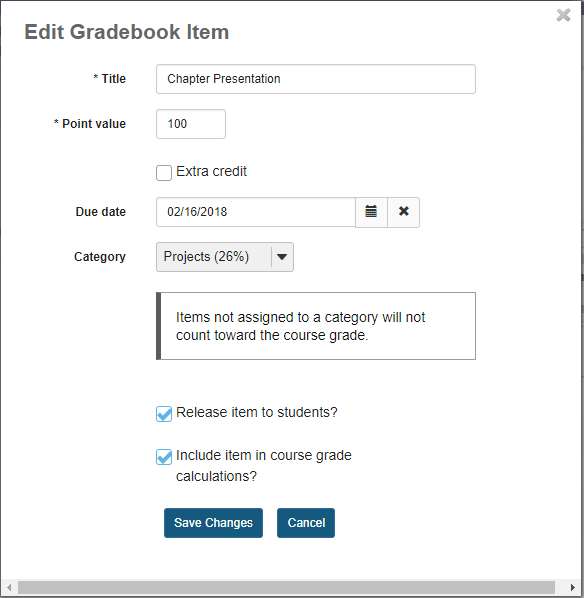 The Edit Item Details option allows you to make changes to extra credit, category, release, and grade calculation settings. 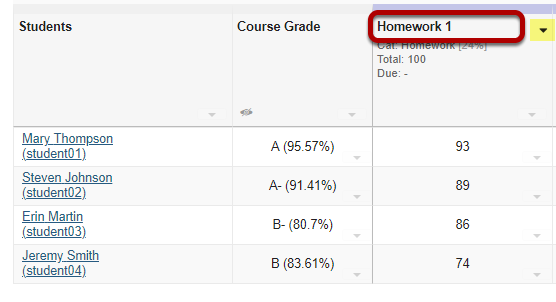 For Gradebook-created items, you may also modify the title, point value, and due date. Items coming from other tools must be modified within the origin tool. 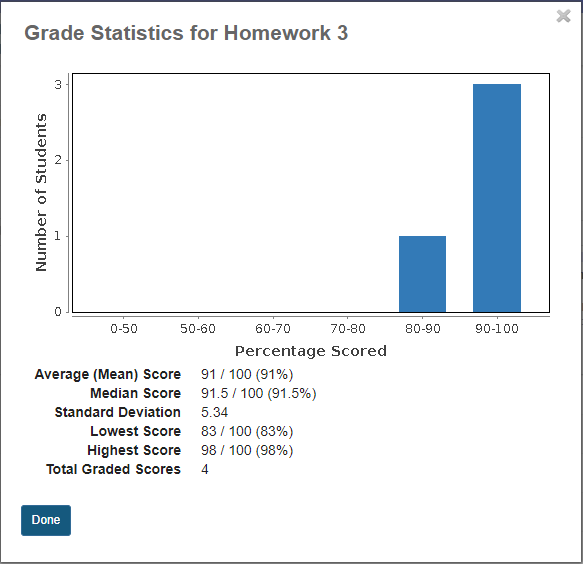 The View Grade Statistics option gives you a quick summary of the grade distribution for that item, including the mean, median, standard deviation, lowest score, highest score, total number of graded scores, and a bar chart illustrating the data. The Move Left option moves the selected item one column to the left. The Move Right option moves the selected item one column to the right. The Hide Item option hides the column from the instructor's display. However, it DOES NOT control release of the item to students. Notice that hidden items are indicated by small arrows in place of the item. Click on the arrows to show the item again. 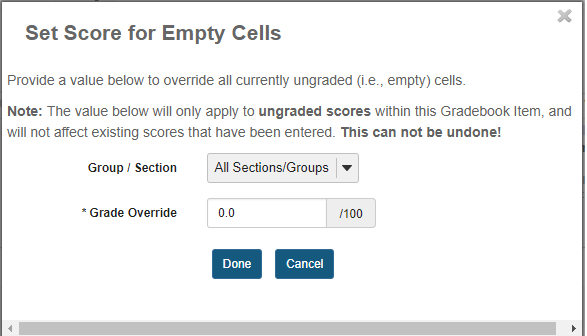 For Gradebook-created items, you may select Set Score for Empty Cells to automatically set the score for all ungraded students for that gradebook item only. You may also select a specific section or group from the drop-down menu to apply the specified grade to only that section or group. This action only applies to students with ungraded items. Previously graded students will not be affected. For Gradebook-created items, you may select Delete Item to remove the item and all associated scores for that item. Note: Be careful! This action cannot be undone! Zoom: Viewing individual student grades. To view all grades for a single student, click on the student's name. The student's individual grade summary will appear. Zoom: The student's individual grade summary will appear. The individual grade summary is the same information a student sees when he or she views their grades. 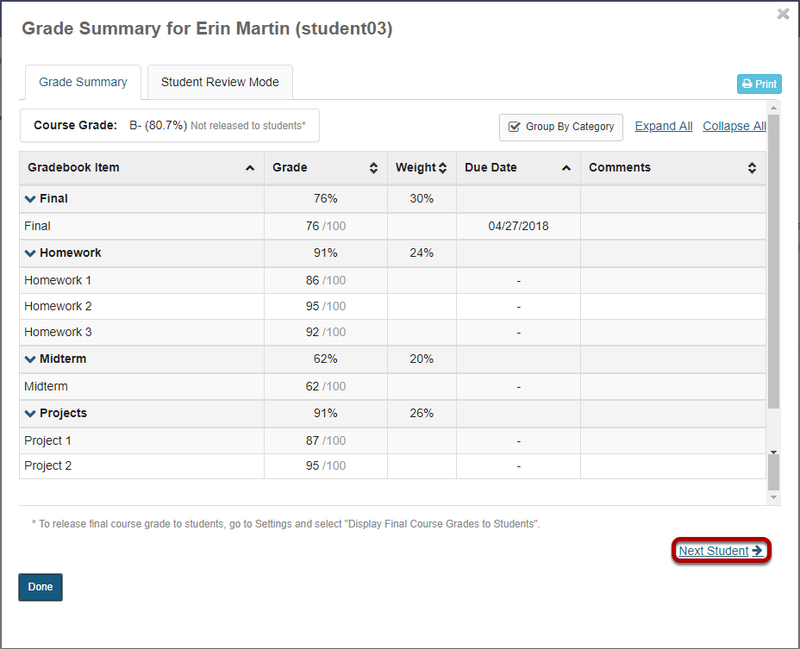 You may use the Next Student link (or the Previous Student link if applicable) to go immediately to the grade summary for the next (or previous) student in the list. 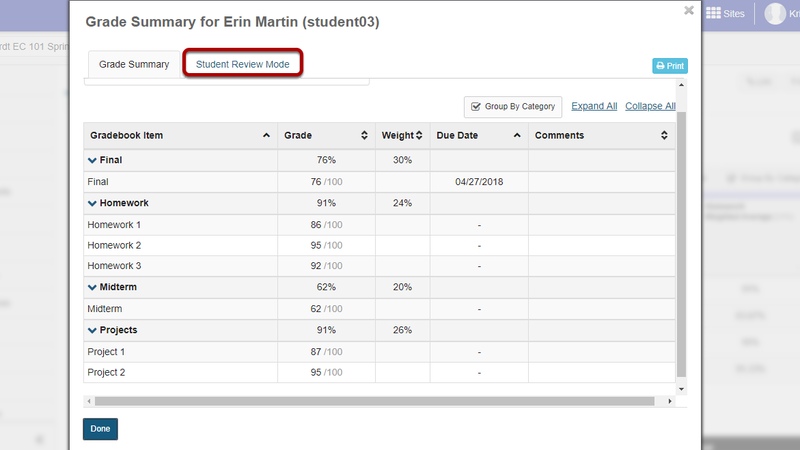 If you would like to discuss the individual grade summary with a student in person, but you don't want the student to see other sensitive information in the gradebook, select the Student Review Mode tab in the individual grade summary window. This option blurs the background so that other students' information is not visible to the student viewing the screen. Zoom: Printing individual student grades. 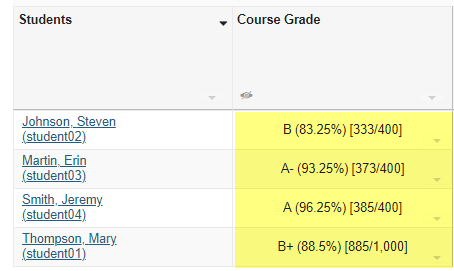 Click the Print button in the individual grade summary screen to print an individual student's grades. Next: How do I set up my Gradebook?